Clark Contracting Limited acquired Lovedays in 2006. Already a long established Hertfordshire company providing local customers with aggregates. Since purchasing Lovedays we have extended our range of products with covering sand, ballast, shingle, cement and top quality topsoil for quick delivery throughout Bucks, Beds, Berks, Herts, Middlesex, London and Oxon. 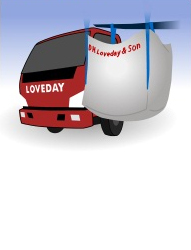 Lovedays offers a quick and friendly service to all of our customers, large and small. We can deliver by tipper or smaller vehicle to site, or if preferred we offer a customer collect service from our Bovingdon yard. Please visit us at our yard at Pudds Cross, Ley Hill Road, Bovingdon, Bucks, HP3 ONW, telephone 01442 831000 and be assured of our best attention to your requirements.